What do Olive’s improving stiff joints have to do with an exit valuation? How does Norman’s trip to Burnley FC relate to an internal rate of return? The answer: for the companies in the Nesta Impact Investments portfolio, it is their impact on people’s lives that drives financial success. Both Olive and Norman are stars in the latest impact report produced by Oomph!, a company dedicated to enhancing the mental, physical and emotional wellbeing of older adults. The report sets out the tremendous success that Oomph! has had over the last year training staff in care homes and community settings to deliver outstanding exercise and activity programmes. Investing in wellbeing really does deliver outstanding results for older adults and their carers. Those taking part in Oomph! 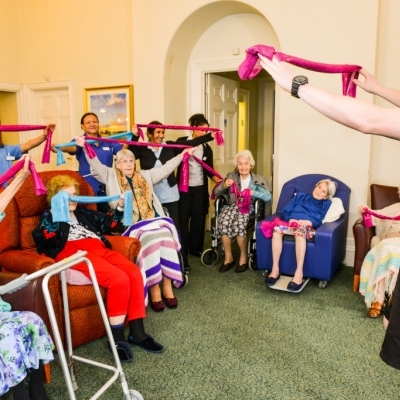 exercise classes say their quality of life has improved and services have seen a 138% increase in uptake, with 78% of care home staff reporting a significant impact on job satisfaction. For Nesta Impact Investments seeing that Oomph! is having a demonstrable impact on the lives of older people is as important to understanding Oomph!’s long-term value as seeing a strong balance sheet. We look to invest in organisations, like Oomph!, where impact and business model are completely aligned. Oomph! attracts and retains its clients because its energetic, fun approach delivers real results. So it’s not just having an impact that counts, demonstrating that impact and communicating is important too. This report from Oomph! is one of the best examples of communicating results we have seen in the sector. We encourage all of our portfolio companies to publish data on their impact (all report privately to us): this is important market information with the potential to increase value. What might look like nice stories intended to give the reader a brief glow before moving onto the financials is in reality the best indicator of the health of our investment.